Paintball Party Fun - Kids Paintball Party Fun! ​​ If you're in the Dallas / Fort Worth area you can ​have your own Backyard Paintball Party Fun! 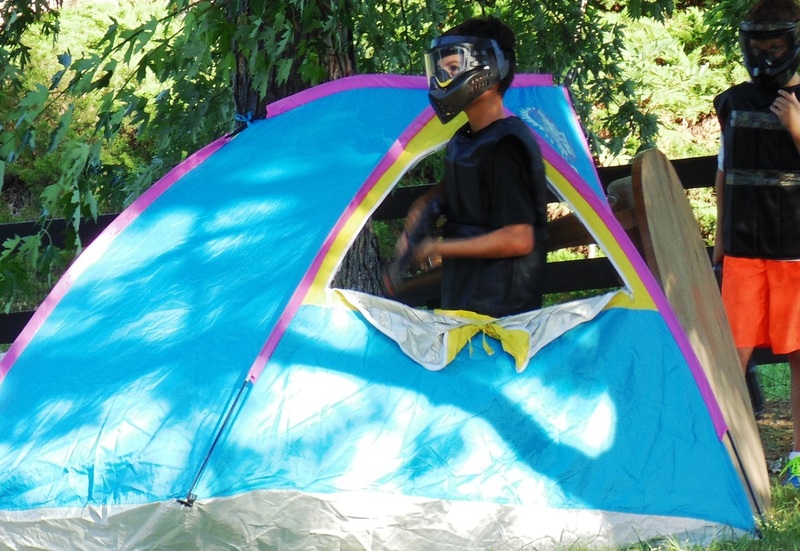 ​Discover a whole new way to have some great outdoor party fun with your own backyard paintball party. You and the kids can actually get into the action instead of just sitting behind the video screen. Ideal for boys and girls Birthdays, Youth Groups, Sports Teams, Family gatherings, etc.. Backyard paintball is a great way to create some lasting fun party memories that everyone will be talking about. Our unique customized paintball markers (guns) are spring loaded and can fire over 100 feet and are accurate to about 40 feet. Its not painful like regular paintball, the paintballs are smaller and they fire at a slower rate and speed, you can actually see the paintballs fly through the air and splat on their target. Its a lot of fun without all the pain, being hit at even point blank range is like being flicked with a rubber band. You don't need a large backyard, 50' by 30' with a small separate set up area is all that is needed, and your host will ensure a fun and smoothly run party. The markers come with swat style laser sights which are great for evening or night time parties. For more info click here. A little planning ahead ensures the best possible party. Try to have your guests arrive 15 minutes before you want the games to start, its better if everyone is there at the beginning to hear the Host explain the rules and how the games work. Parties are usually at least an hour long with most kids more than happy to play for 2 hours or more. Saturday is the most popular party day, but Friday afternoon/evening is also a good time when most people are available. Get the adults involved, kids love playing against the adults (especially when they get to win ;). You can even dress up for more party fun; military, zombie, and Halloween are all popular themes. Have lots of water readily available and a few snacks. Have a video/camera available to catch those precious golden moments. Click Here to check out some more pictures or Here when you're ready for your own Backyard Paintball Party fun.